Recognizes endogenous levels of Factor XII HC protein. KLH-conjugated synthetic peptide encompassing a sequence within the N-term region of human Factor XII HC. The exact sequence is proprietary. Small volumes of anti-F12 antibody vial(s) may occasionally become entrapped in the seal of the product vial during shipment and storage. If necessary, briefly centrifuge the vial on a tabletop centrifuge to dislodge any liquid in the container`s cap. Certain products may require to ship with dry ice and additional dry ice fee may apply. Western blot analysis of Factor XII HC expression in MDAMB435 (A), NIH3T3 (B) whole cell lysates. 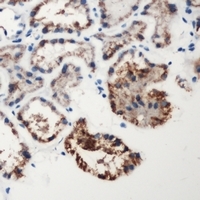 Immunohistochemical analysis of Factor XII HC staining in human kidney formalin fixed paraffin embedded tissue section. The section was pre-treated using heat mediated antigen retrieval with sodium citrate buffer (pH 6.0). The section was then incubated with the antibody at room temperature and detected using an HRP conjugacompact polymer system. DAB was used as the chromogen. The section was then counterstained with haematoxylin and mounted with DPX. NCBI/Uniprot data below describe general gene information for F12. It may not necessarily be applicable to this product. F12: Factor XII is a serum glycoprotein that participates in the initiation of blood coagulation, fibrinolysis, and the generation of bradykinin and angiotensin. Prekallikrein is cleaved by factor XII to form kallikrein, which then cleaves factor XII first to alpha-factor XIIa and then trypsin cleaves it to beta- factor XIIa. Alpha-factor XIIa activates factor XI to factor XIa. Defects in F12 are the cause of factor XII deficiency (FA12D); also known as Hageman factor deficiency. This trait is an asymptomatic anomaly of in vitro blood coagulation. Its diagnosis is based on finding a low plasma activity of the factor in coagulating assays. It is usually only accidentally discovered through pre-operative blood tests. F12 deficiency is divided into two categories, a cross-reacting material (CRM)-negative group (negative F12 antigen detection) and a CRM-positive group (positive F12 antigen detection). Defects in F12 are the cause of hereditary angioedema type 3 (HAE3); also known as estrogen-related HAE or hereditary angioneurotic edema with normal C1 inhibitor concentration and function. HAE is characterized by episodic local subcutaneous edema, and submucosal edema involving the upper respiratory and gastrointestinal tracts. HAE3 occurs exclusively in women and is precipitated or worsened by high estrogen levels (e.g. during pregnancy or treatment with oral contraceptives). It differs from HAE types 1 and 2 in that both concentration and function of C1 inhibitor are normal. Belongs to the peptidase S1 family. 1. Women with low FXII level might have an increased risk of premature delivery at < 34 GW.